Get started orchestrating containerized applications at scale. Check out the Kubernetes sessions at the Velocity Conference in San Jose, June10-13, 2019. Early price ends May 3. In Containerizing Continuous Delivery in Java, we explored the fundamentals of packaging and deploying Java applications within Docker containers. This was only the first step in creating production-ready, container-based systems. Running containers at any real-world scale requires a container orchestration and scheduling platform, and although many exist (i.e., Docker Swarm, Apache Mesos, and AWS ECS), the most popular is Kubernetes. Kubernetes is used in production at many organizations, and is now hosted by the Cloud Native Computing Foundation (CNCF). In this article, we will take the previous simple Java-based, e-commerce shop that we packaged within Docker containers and run this on Kubernetes. Before we start creating the required Kubernetes deployment configuration files let’s first learn about core concepts within this container orchestration platform. Kubernetes is an open source orchestrator for deploying containerized applications that was originally developed by Google. Google has been running containerized applications for many years, and this led to the creation of the Borg container orchestrator that is used internally within Google, and was the source of inspiration for Kubernetes. If you are not familiar with this technology then a number of core concepts may appear alien at first glance, but they actually hide great power. The first is that Kubernetes embraces the principles of immutable infrastructure. Once a container is deployed the contents (i.e., the application) are not updated by logging into the container and making changes. Instead a new version is deployed. Second, everything in Kubernetes is declaratively configured. The developer or operator specifies the desired state of the system through deployment descriptors and configuration files, and Kubernetes is responsible for making this happen - you don’t need to provide imperative, step-by-step instructions. These principles of immutable infrastructure and declarative configuration have a number of benefits: it is easier to prevent configuration drift, or “snowflake” application instances; declarative deployment configuration can be stored within version control, alongside the code; and Kubernetes can be largely self-healing, as if the system experiences failure like an underlying compute node failure, the system can rebuild and rebalance the applications according to the state specified in the declarative configuration. Services - Kubernetes Services provide load balancing, naming, and discovery to isolate one microservice from another. Services are backed by Replication Controllers, which in turn are responsible for details associated with maintaining the desired number of instances of a pod to be running within the system. Services, Replication Controllers and Pods are connected together in Kubernetes through the use of “labels”, both for naming and selecting. Let’s now create a service for one of our Java-based microservice applications. Docker for Mac / Windows / Linux - This allows us to build, run and test Docker containers outside of Kubernetes on our local development machine. Minikube - This is a tool that makes it easy to run a single-node Kubernetes test cluster on our local development machine via a virtual machine. A GitHub account, and Git installed locally - The code examples are stored on GitHub, and by using Git locally you can fork the repository and commit changes to your own personal copy of the application. Docker Hub account - If you would like to follow along with this tutorial, you will need a Docker Hub account in order to push and store your copies of the container images that we will build below. Java 8 (or 9) SDK and Maven - We will be building code with the Maven build and dependency tool that uses Java 8 features. Feel free to load the shopfront code into your editor of choice, such as IntelliJ IDE or Eclipse, and have a look around. Let’s build the application using Maven. The resulting runnable JAR file that contains the application will be located in the ./target directory. $ docker build -t danielbryantuk/djshopfront:1.0 . We have now successfully deployed our first Service into Kubernetes! You can see from the results of the curl against the application/health endpoint that the application is up and running, but we need to deploy the remaining microservice application containers before the application will function as we expect it to. $ docker build -t danielbryantuk/djproductcatalogue:1.0 . $ docker build -t danielbryantuk/djstockmanager:1.0 . At this point we have built all of our microservices and the associated Docker images, and also pushed the images to Docker Hub. Let’s now deploy the productcatalogue and stockmanager services to Kubernetes. 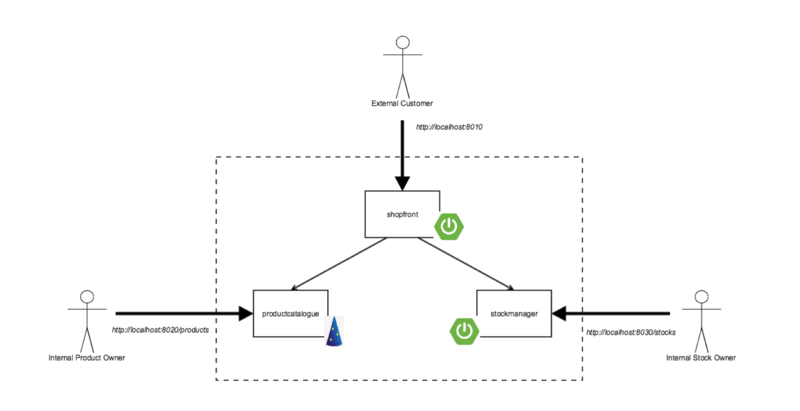 In this article, we have taken our application that consisted of three Java Spring Boot and Dropwizard microservices, and deployed it onto Kubernetes. There are many more things we need to think about in the future, such as debugging services (perhaps through the use of tools like Telepresence and Sysdig), testing and deploying via a continuous delivery pipeline like Jenkins or Spinnaker, and observing our running system. This article was created in collaboration with NGINX. See our statement of editorial independence. Learn basic Kubernetes concepts and mechanisms for automating the deployment, maintenance, and scaling of your Java applications with “Kubernetes for Java Developers.” Download your free copy. Article image: Container (source: StockSnap).